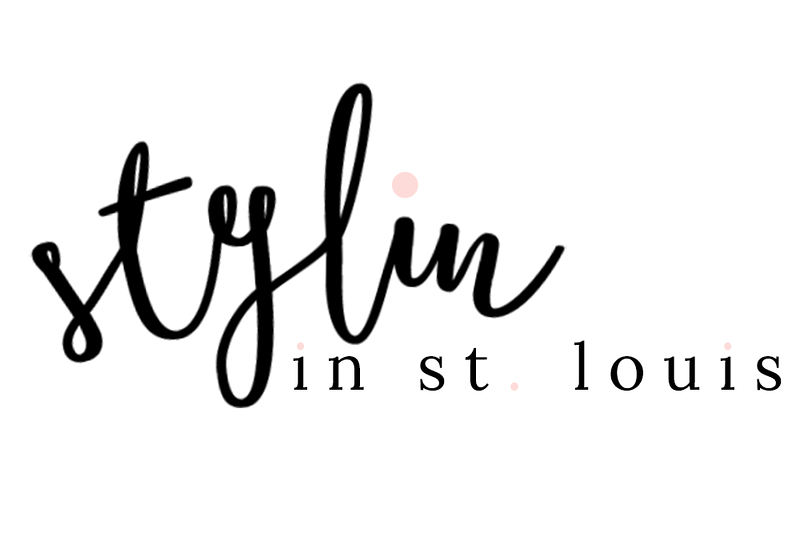 Stylin in St. Louis: Spotlight Weekly Link Up: Skirts…. Spotlight Weekly Link Up: Skirts…. My husband thinks that my coat is ridiculously bright. I could be spotted anywhere in it. I told him, I guess you will never loose me in a crowd! I will be the lady in the pink coat! This week, our Spotlight Weekly theme is skirts! I have worn this skirt a million times because I love it so much! It is comfy and I love that I can pair it with anything! It is hard to tell, but it is pleated which makes it that much more fun! I love skirts and I think that are more comfortable than pants! I cannot believe I went through a "I do not wear skirts phase" in middle school! What was I thinking? Come share your skirts or any fashion related post with Elle and I! We welcome all fashion related posts! If you would like to co-host send Elle or I an email! We would love it! Spotlight: Our Spotlight of the Week is Ainslee from A Beautiful Heart! Elle and I adore her style and this dress is just perfect with all those amazing accessories! Go check out her blog! 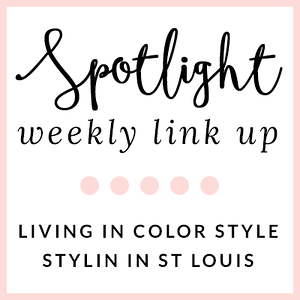 Next week: Next week our spotlight weekly theme is Winter White! Come share you favorite whites for winter! Thanks for linking up! See you next week! I had to laugh at your comment on no skirts in middle school. I think all girls in middle school go through this phase. I try to get my 7 year old to wear dresses and skirts as much as possible because I know the only jeans-and-tshirt phase is coming. I love your coat and may need to buy one similar for when we move back north next year. I love your coat and have worn a similar outfit minus the coat and love that too. You look great! Love this coat! I have a short moto jacket in the same shade and it's a bit bright but it brings so much cheer any day! Thanks Alice! It is always fun to add a pop of color on a cold day! I absolutely love the hot pink coat! You look adorable in the pom pom hat too! hey, bright=happy! :) great outfit! Thanks Katie! You are so sweet! I love this coat!! It is so awesome BECAUSE it is so bright!! Husbands don't know anything about fashion. You look fabulous! love the coat! you wear bright colors so well. Thanks Ellen! You are so sweet! I love this pink coat! I just started following on Bloglovin and can't wait to see more posts!! Great coat. The color is so bright and vibrant and I love it paired with your leopard handbag. I just love that coat on you! Sometimes what husbands and significant others think are ridiculous are actually quite marvelous - like this coat! I love it every time I see you in it! Love this look - the boots are perfect with that skirt! Oh my gosh, this is too cute. Your coat and lip color are my favorite! It's like those light up sneakers my mom would put on me as a little girl so she could just look under the racks and find me if I ever wandered off... but so much more fashionable! 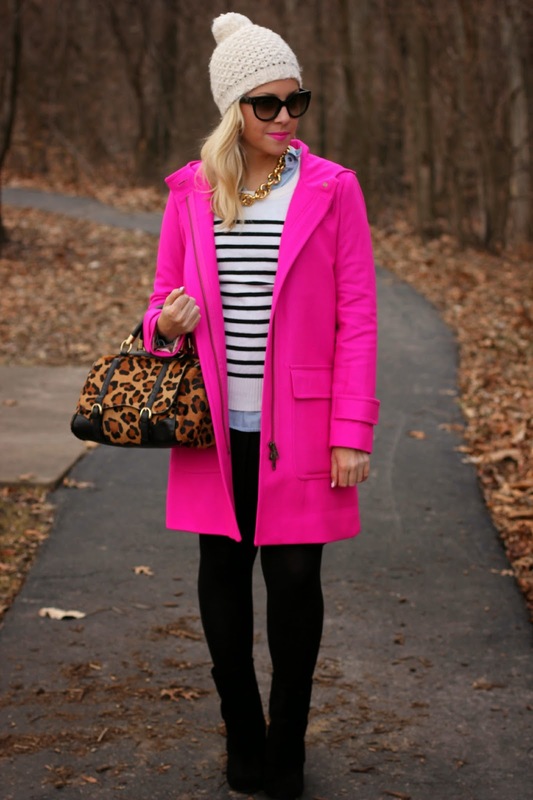 I love the coat, anything in a neon bright hue and I am sold! This entire outfit meshes together so perfectly. I agree! Those sneakers were so much fun! Thanks Cara! Neons and leopard?! Yes, please. Love the outfit and the inspiration! This coat is absolutely gorgeous! Your COAT, that is stunning! Dying for a bright winter piece like that to cheer up these freezing dreary days! I am absolutely loving this outfit! Love the pop of pink! I seriously love your coat! I think your man should love the bright color because he will always know where you are!! hahah. I got a bright pink coat for my birthday and absolutely love it!! Ooohhh I love the coat! !